1. Locate the item’s record in the Library Search Catalog or from the finding aid on the Online Archive of California (OAC). 2. 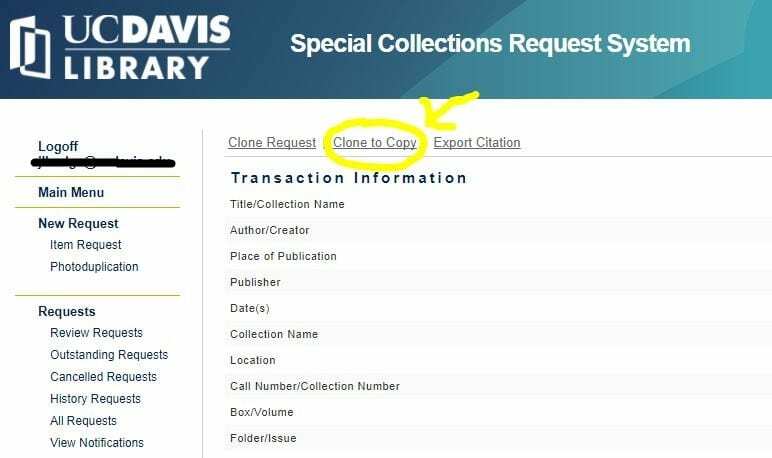 Request the item, following the steps outlined in the Request Materials section of the Special Collections Request System (Aeon) page. 3. When prompted, log in to your Aeon account. 4. Click the Switch to Duplication Form button. 5. Complete the required fields marked with a red asterisk. 7. Check off all boxes that apply in regards to your duplication request (if applicable). 8. To add details, special requests, questions or notes, use the Special Requests/Questions? field. 1. Sign into your Aeon account at aeon.library.ucdavis.edu . 2. Locate the Requests record for the item you have viewed; click it so that you see the detail page. 3. Click Clone to Copy at the top of the page; this will open a new Photoduplication Request form with the item information automatically completed. 4. Follow steps 5-9 listed above. The turnaround time varies based on the requested service(s). Please inform the staff if you are working with a specific deadline. While we are unable to guarantee a delivery date, staff make every effort to complete all requests as quickly as possible in the order requests are received.